Most of the blog's readers are no doubt already aware of the open letter entitled A Common Word Between Us and You, which was issued by a group of Muslim leaders back in October. This was later followed by a full-page advertisement in the New York Times, entitled Loving God and Neighbor Together: A Christian Response to A Common Word Between Us and You, which was written by several scholars at Yale Divinity School's Center for Faith and Culture and was signed by over 300 Christian leaders and scholars. Well, not surprisingly, this "Christian" response left a lot to be desired, and John Piper has done a great job in the above video explaining why. I couldn't agree more with John on this issue, and I am indebted to Justin Taylor of the Between Two Worlds blog for bringing his response to my attention. Justin also offers another great recommendation for those who would like to hear more from John on these issues, a 2002 article entitled Tolerance, Truth-Telling, Violence, and Law: Principles for How Christians Should Relate to Those of Other Faiths. Thanks, John, for you typical candor, common sense, and commitment to Scripture in your response to this increasingly important matter. The latest update to e-Sword (v7.9.4) was made available just a few days ago, on January 19. I apologize to the blog's readers for my tardiness in posting the information here. This version has a new Sermon Illustrations feature. Stronger Strong's implementation throughout the program. Popup ToolTips now in commentaries, dictionaries, notes, etc. Viewer menu to toggle use. Fixed some Vista display issues. Some of you may recall my earlier post about e-Sword, that included a link to a nice review. 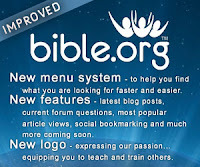 If you have yet tried this terrific - free - Bible study software program, I highly recommend it. The sample from which this is taken is getting larger - with 109 responses so far - but I remain hopeful that I may be able to get several hundred responses to the poll over the course of its one year lifespan. There are 182 days left, so if you haven't responded yet, scroll down to the bottom of the page and weigh in. P.S. Some of you may have noticed that the percentages Blogger lists don't always add up to 100. This appears to be due to Blogger's rounding the numbers up or down. But the tallies still give us a pretty good idea where things are. At the end of the year, I will try to figure the percentages more accurately. Bible.org is one of those sites I use constantly, and now it has been completely redesigned and is easier to use than ever. It has so many helpful articles and Bible study tools that it would be hard to list them all here. I am especially fond of the way I can have it list all their articles according to the Scripture passage I am currently studying. I also find the 'Pastoral Helps' (under 'Communities') section very worthwhile. It has a wealth of information, from various preaching and teaching aids for special occasions (such as weddings or funerals) and holidays to administrative and organizational aids. I also use their database of sermon illustrations (under 'Study Tools') on a regular basis. You can search for illustration by topic or Scripture passage. Long-time blog readers may remember that I recommended this feature of Bible.org in an old article entitled Online Sources for Sermon Illustrations. Well, I haven't changed my mind, it is still one of the best and easiest to use online resources available. I remember one of my professors as Covenant Theological Seminary declaring in class one day that "Reformed theology isn't perfect; it is just the best we can do." Well, of course he was referring to Reformed Presbyterian theology, so I cannot agree that it is the best we can do. But I would say the same thing about my own Reformed Baptist theology. It is not perfect, but it is indeed the best we can do. The reason it is not perfect is that it is our human attempt to systematize the various doctrines taught in Scripture and – as long as it is us doing the systematizing – we must humbly admit that it cannot be perfect. And we must also humbly admit, I think, that our system of theology has its problem passages just as does any other system of theology. But I would argue that our problem passages are much fewer in number and that we have much better answers for them than any other system of theology. This means, of course, that the Baptist Confession of 1689 itself – and the system of theology contained therein – is also not to be elevated to a place of authority over or equal to Scripture. Reformed Baptists, then, with their strong commitment to the principle of Sola Scriptura and to the inerrancy and sufficiency of Scripture, should of all people recognize the danger of allowing our confessions and traditions to take on an authority they do not and cannot ever possess. Yes, we should respect our heritage and the teachings that have come down to us by the grace of God, but the best way to do that is by remaining humble before Scripture and recognizing that Reformed Baptist theology isn't perfect, even if we believe it is the best we can do. "New Year's" Resolutions or New Life Resolutions? The USA.GOV website lists these thirteen as the most popular New Year's resolutions: 1) lose weight, 2) pay off debt, 3) save money, 4) get a better job, 5) get fit, 6) eat right, 7) get a better education, 8) drink jess alcohol , 9) quit smoking now, 10) reduce stress overall, 11) reduce stress at work, 12) take a trip, and 13) volunteer to help others. general. Resolved to do this, whatever difficulties I meet with, how many soever, and how great soever. 32. Resolved, to be strictly and firmly faithful to my trust, that that, in Proverbs 20:6, "A faithful man who can find?" may not be partly fulfilled in me. for it. Dec. 19, 1722. 43. Resolved, never, henceforward, till I die, to act as if I were any way my own, but entirely and altogether God's; agreeable to what is to be found in Saturday, January 12, 1723. I will strive most to feel and act good-naturedly; yea, at such times, to manifest good nature, though I think that in other respects it would be disadvantageous, and so as would be imprudent at other times. May 12, July 11, and July 13. 62. Resolved, never to do anything but duty, and then according to Ephesians 6:6-8, to do it willingly and cheerfully as unto the Lord, and not to man: "knowing that whatever good thing any man doth, the same shall he receive of the Lord." June 25 and July 13, 1723. 64. Resolved, when I find those "groanings which cannot be uttered" (Romans 8:26), of which the Apostle speaks, and those "breakings of soul for the longing it hath," of which the Psalmist speaks, Psalm 119:20, that I will promote them to the utmost of my power, and that I will not be weary of earnestly endeavoring to vent my desires, nor of the repetitions of such earnestness. July 23, and August 10, 1723.